On April Fool’s day, I received the following comment from Beth about how she rears her children not to become part of the herding sheeple, the lemming-like humanity. 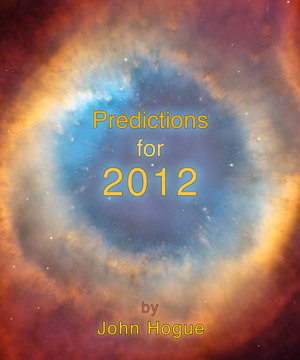 This observation probably comes from reading a chapter called “The Lemming Syndrome” in my printed examination of doomsday and “bloomsday” predictions, entitled, The Millennium Book of Prophecy: 777 Visions & Predictions from Nostradamus, Edgar Cayce, Gurdjieff, Tamo-san, Madame Blavatsky, Old and New Testament Prophets and 89 Others. The most important lesson we can learn from prophecy is to understand and transcend the nature of programmed habit that makes us each serial repeaters of mistakes from the past carried over into our future generation after generation. The right education of our children is fundamental to breaking this negative pattern before it breaks and consumes are civilization, and soon. Dear John, (I hope you don’t mind me calling you that) I now know why yours are the only books I buy, I find the money (despite my apparent lack in this world.) I have explained to my kids from the day they were born, the one thing I will not tolerate are LEMMINGS. They have to explain to me with 3 if not more supporting reasons, why they are doing something and BECAUSE he/she/they DID IT is NOT ACCEPTABLE as a reason. I was born with what I call a “truth-o-meter”, which is the KNOWING that all information goes through to be accepted by the KNOWING or thrown off. So everything goes through a scientific test for me, it has made me stubborn and difficult but more importantly impervious to anyone else’s BELIEF. The art of life and parenting (which is an ultimate form of educating) each generation requires sometimes a slap with a velvet glove. As much as one needs to keep it true, keep it explained, one must do these things also with tenderness and love, having that wordless holding of love. Also, it is equally important that we live by example more than by our words, because the language of action and example is what children easily can see and recognize. You have to explain to them as much as they explain to you, why a thing has to be a certain way. You must not act like a Lemming or at least seek to expose in yourself any “lemming-ness” as it is there in you. Lemming conditioning taints everyone. So, strength and humility together in action and living by example more than words are the golden ways of teaching the next generation not to be seeded with our mistakes. I recall Osho once saying that adults have to explain to children more about what they did wrong in their lives rather than proudly proclaim what they did right. G.I. 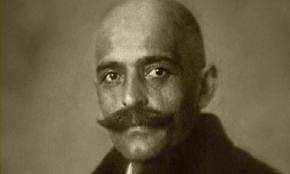 Gurdjieff (1866-1949), a prophet of remembering the "self" in the harmonious development of man without quotation marks. The truth is: children are the ones just recently removed from a state of disembodied truth into our world of dialectics, transience, politics and mortality. They have a presence of truth that we have mostly forgotten, yet, ironically, we are put in the position of being their teachers when we are the ones needing to be taught – needing to be, as Yeshua once advised, like innocent children once again, to remember the Kingdom of Heaven being at hand, immediate, all around and inside of us. I call myself the REBEL with a CAUSE. I want to make it clear, Beth, that what I am saying in my responses to you today do not make a reactive jump to judgment about you. I do not know you, beyond the impact of your initial words. I am actively aware as one who is constantly, quickly and often reactively judged as “good” or “bad” by thousands of people every day for what my words say how words do not make the man or the woman. I must take time to delve into their words, their books and even then, the mystery of being human is complicated by so many personas that we are taught to affix to our souls. In the end, it is perhaps the wordless in us that is a bridge. It is the silence of the witnessing consciousness that makes each individual “drop” contain the oceanic “whole” that in us all, is the same water, the same saltiness of consciousness. With that preamble aside now, I have today before me your words and how they are used. I am a little concerned by the upper case use and some absolute language such as “I will not tolerate LEMMINGS”, when speaking to your children. The words are overbearing. I am not saying “you” are overbearing but the words you use resonate this. I do not believe this was your intent. We cannot push consciousness on children, whatever age they are: two years, twenty years, eighty years old. 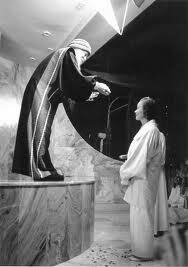 A balanced nuance of strength and tenderness, authority with humility is needed. Whatever we expect of others we must first expect of ourselves on the path of truth. Osho in the late 1980s showering Japanese seeress, Tamo-san, with rose pedals. The following day, I was invited to have lunch with Tamo-san when a letter from Osho was delivered. In it, Osho, acknowledged her enlightenment but then asked if she was aware of something greater, "beyond enlightenment." My meditation teacher was oceanic enough to contain many contradictions, but he seemed consistent, in my memory at least, for what its ego-filtering worth, when it came to his disciples categorically judging the state of spiritual development of other disciples. He could strike your judgment like lightning. We cannot judge what is the state of awareness of others on the path. Better to look at oneself and ask what level I am in my development. Equally, one must not be too hard a judge of oneself. Self-loathing is an occupational hazard of meditation. When you begin to see to what extent you are programmed to be a false persona of society, you can hate yourself rather than accept and let go of it. Hating is not a bad thing. Wrong hating is bad, though. You can hate conditioning but you cannot hate the conditioned one, be it your Lemming state or the Lemming state of your children or others. I have found that celebrating hate in this positive way can transform hate into compassion for myself, for you, and others. Though one cannot judge the state of spiritual evolution of others, one can understand to what extent we are stuck and consciously retarded in fundamentally similar ways by our programming and conditioning by society. In other words, if you look deeply and dispassionately into your own mess of a mind, you come to understand if you go a little deeper it reaches and shares the same level of everyone’s dilemma of mind. So, when in these pages of Hogueprophecy you all at times see me taking apart politicians, religions and individuals, I do not do this because I am better than them. I do this because “I am them” with a little difference. I have begun to see myself, my mask of ego, the coating of identity that has suppressed the enlightened, eternal child. I have looked below the surface of John Hogue and his surface identities under which lurks the collective ego dilemma. Thus I prepare the way for my readings of the world, if you will, with an understanding of and a compassion for “all of us” in our current dilemma. Thus I am ever taking my own illusions down when I am taking people’s ideas to task because through meditation I see that they are one and the same. Occupy your "self" with meditation. “I’m OK, you’re OK” is not my way. We are trapped in minds conditioned to repeat the past and call it the future, generation after generation, millennia after millennia. This mind is the food of predictability. The mind unconsciously set in its ways like a zombie dreaming that it is awake and in control. It is this borrowed, conditioned dream that becomes a fundamental fossilized fuel of traditionalized habit that powers prophecy and prediction. The world is about to meet a singularity in the “Roaring 2020s”, a critical mass of habit that keeps instilling in the young our conditioned and Pavlovian mistakes as “virtues” will reach a point of unsustainable reality. If a spiritual revolution is not born in us through self-observation the world as we know it will collapse. Civilization will collapse and perhaps set us back 500 years before we must get to this crisis growth point of human evolution once again. Concepts in prophecy like final judgment, Armageddon or blaming all of these negative outcomes on a figure called the Antichrist are figments of our conditioning. We are not seeing these things straight or understanding our dilemma at the core. 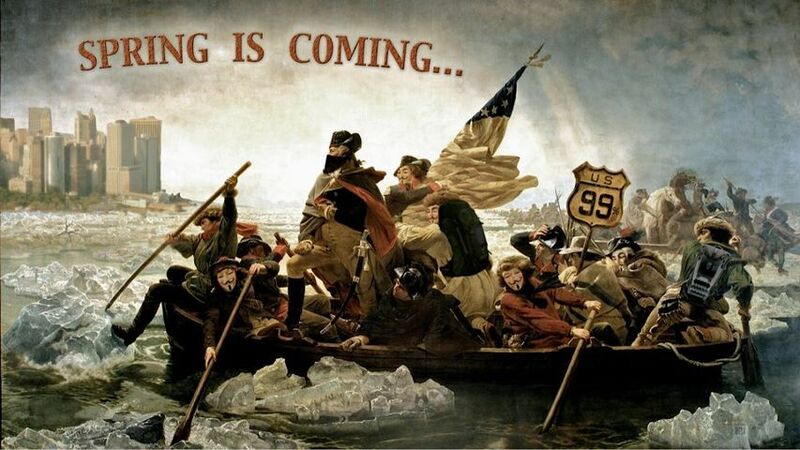 The most important essay I have yet written ends my e-book Nostradamus and the Antichrist, Code Named Mabus (http://www.hogueprophecy.com/store-nostradamus-mabus/). I took the reader on a trail to candidates for Antichrist. It begins as a prophecy detective story. We weighed evidence about and collected suspects for Nostradamus’ third and final Antichrist – a person who is our contemporary, in fact. It could be Saddam Hussein, G.W. Bush, Osama bin Laden, current US Secretary of the Navy Ray Mabus, even President Barack Obama. 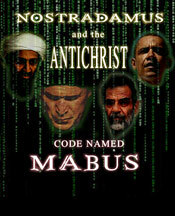 (To see an overview of the top suspects for Nostradamus’ first, second and third antichrist, click on Mabus). I then move the search to a deeper level, one in which each and every one of us, in our habitual, programmed living, is made to contribute to a collective unconsciousness that promotes shadows of illusion and makes us forget our inner light. It is like we are programmed to identify with our shadows rather than see the thing shadowed by the light of truth on the wall. 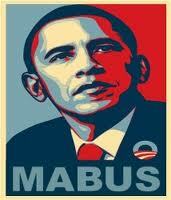 He is not the only candidate, but his name does spell out "Mabus". Phoenetically using the corrected pronunciation, spell his Kenyan family name -- Oubama, or Ubama. Next, you get -- maabu. Replace the redundant letter "a" -- mabu. You are allowed to add one completely new letter, the "s" -- Mabus. I can understand how easily these words today can convey something pretty scary and heavy. And yet, I know how children on Halloween can be made frightened by big and oversized projections of monsters in shadow on the wall. This fundamental conspiracy of unconsciousness is like that monster projected on the wall. It is just a shadow. It is not real. We have made the monster real. We can make it disappear in the light of our reawakened souls. This is done one individual at a time. Mediation takes us inward. It dissolves Apocalypse into “Revelation”. It lifts the veil of shadows and lets us “see” again, from inside, things as they are, with the eternity of the present and the genius of IN-nocence. Meditation gives us IN-Security and it makes every individual IN-Significant. And there is much light, love and bliss beyond the shadows if we but look in, confront the Antichrist Unconscious. That is only a monster of shadow we merely have been taught to project as a reality. If you are interested in exploring the meditations I use to make the mind’s monsters into harmless shadows in the light, Contact Me and I will freely give you that information. 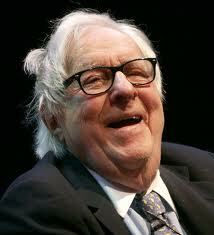 PS—My personal recollections of Ray Bradbury who died last week on the day of the Venus-Sun transit (5 June 2012) will be coming as well as further commentary on what has been the hottest 12 months of weather temperatures ever recorded in US history that include record breaking temperatures a whole 5 degrees on average above the previous record. My Oracle forewarned the world about the coming advent of this temperature tsunami back in late 2009. If you are not already a member, please join my free newsletter now and be the first to know when the blog will be posted.